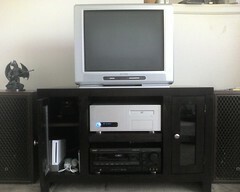 This is my Entertainment Center (03/16/08). It is a Golden Oak 42″ Chocolate Oak Finish Del Mar. On top of it is a 24’in Philips Energy Star Television. Below is a Duel-tuner HTPC running MythTV 0.21 and Mythbuntu 7.10. Below it is a Teac AG-V8500 AV Receiver. To the left is the Nintendo Wii with two Wiimote including Legend of Zelda and Smash Bros Brawl games.